While the primary focus of VJ software like VDMX is live visual performance, often times parts of a show rely on tightly arranged events that happen at specific times. The Cue List plugin bridges the gap between these two worlds by allowing you to create pre-planned data-source events and clip triggers that can run in sync with timecode or musical tempo. In this introduction video tutorials we'll examine the various interface controls and settings that can be used to customize the behavior of the Cue List plugin to work in a variety of situations. The main interface for the Cue List plugin contains two sections. Along the top are transport controls for jumping between cue points. The bottom section shows a list of cues that are contained within this instance. The available search field can be used to filter the list to find specific cues by name or target. ▶ button: Jumps the time to this cue. Triggers for this button can be configured from the UI Inspector when its row is selected. Time: Indicates the time offset at which the cue is activated. The style for the timecode can be set in the options inspector. Target: Indicates which datasource or layer is changed when this cue becomes active. The datasources and types can be configured in the Cue List options inspector. Value: The value to set the specified datasource to, or the clip to trigger to the specified layer, when this cue becomes active. When the target is set to a layer, this column will provide a pop-up menu that allows for selecting clips based on your page organizations. Title: A custom title for the cue. Useful for adding a note or searching the list. √ toggle: Used to enable / disable individual cues. Disabled cues are skipped during playback. 🔒 toggle: Used to lock the settings for an individual cue. When enabled the time, target, value, title and enabled state can not be modified. At the very bottom of the list of cues is a standard bar that contains buttons to add (+) and remove (-) items from the list view. The sprocket menu contains additions options such as grouping a set of cues and quickly changing the enabled / locked state of multiple items at a time. 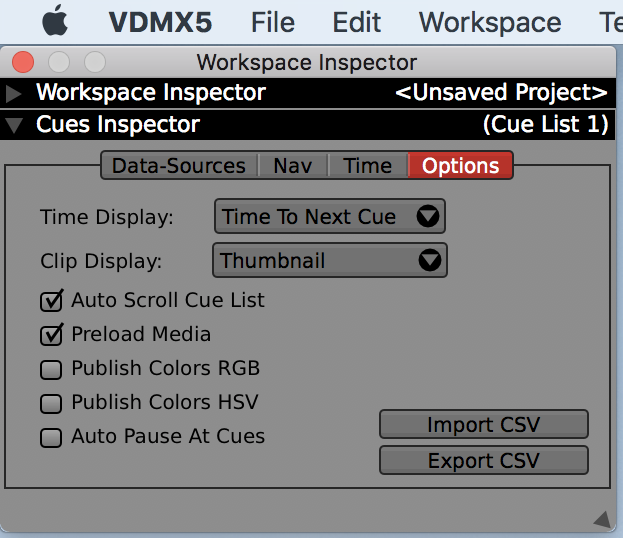 From the options panel in the Workspace Inspector you can configure the Cue List in more detail. When viewing the plugin in the Workspace Inspector, there are four main tabs of settings to adjust. Data-Sources: Used to add, remove and adjust parameters for each data-source published by the plugin. Available types include float, index, boolean (on/off), color, strings and events. For applicable data-types (floats and colors) an optional interpolation mode can be set for fading between values. Selecting a data-source from the list will also reveal a further sub-inspector from which the values can be sent directly to OSC / MIDI / DMX targets in addition to being published internally. Nav: From this tab the data-source receivers for three controls can be configured: 'Jump to cue by float', 'Jump to cue by index', and 'Jump to cue by string' each of which can be used to jump the current time of the plugin to match the cue specified by values received. Time: For each Cue List plugin, the style of time formatting can be set to 'Index', 'Beats', 'Measures', 'Seconds' or 'SMPTE' time. This tab also contains settings for adjusting the looping behavior, start time offset and syncing the time to a Clock or Timecode plugin. Options: Display options and other useful behaviors such as auto-pausing and pre-loading media can be found in this tab. From here you can also import / export the contents of the cue list to a CVS file for backup or modified using standard text editor / spreadsheet software. With all of these settings it is easy to use the Cue List plugin either as a starting point for designing new projects or as a new way to add automation in your existing projects or templates. After you've completed this tutorial, read about how to use Ableton Link to keep the BPM / measure position of clock plugins in sync or how to stream the output from VDMX to services like Twitch using OBS. The sub-inspector for each data-source in a Cue List can be used to directly send to multiple MIDI, OSC and DMX targets for each item.